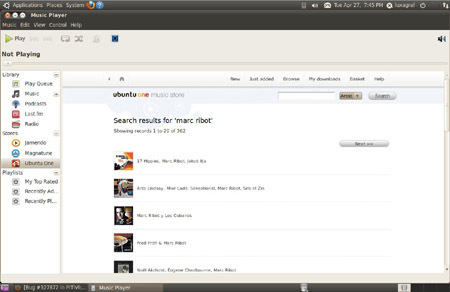 Review Ubuntu 10.04, officially available as of Thursday, is an important update for this popular Linux distro. It's a Long-Term Support (LTS) release - the first since 8.04 two years ago - and it wraps social network with media capabilities and a brace of online services in a brand new look. As an LTS edition, Lucid Lynx will be supported for the next three years on the desktop and five years on the server instead of the usual 18 months of free security updates. Therefore, it will set the scene for Ubuntu for a decent chunk of time and provide a launch pad for the distro's move down a more refined and user-friendly path that subsequent releases should build upon. Ubuntu founder Mark Shuttleworth wants Ubuntu to beat Apple's OS X on features and interface polish. While Lucid Lynx still has some rough edges, this release is a huge leap for UI design in Linux and puts Ubuntu well on its way to Shuttleworth's goal. There are, however, some changes that will no doubt raise the ire of die-hard Linux fans. For example, the close, minimize and maximize window buttons are now on the left (ala OS X) by default. It's a small change, but an endlessly frustrating one if you're used to the old style. Fortunately, a quick trip to the gconf-editor will realign the buttons with your muscle memory. Other, less annoying changes give Ubuntu a nice, more polished look. Most of the GNOME panel widgets look much nicer in this theme, and the icon set is considerably better than what we saw in the beta. But the changes in Ubuntu 10.04 aren't just skin deep. There are quite a few new applications, features, and services that make Ubuntu seem more like a consumer-friendly operating system like OS X than the Linux of the command line loving past. Between Canonical's web-based syncing service Ubuntu One, the coming U1 music store and the new Me Menu, Lucid Lynx is looking less like the stoic Linux desktops of yesteryear and more like like, well, what everyday consumers want in an operating system. It's even got quite a few features Apple can't match. Oh, and it's free. The installation process for Ubuntu hasn't changed much over the last few releases, though the installer 10.04 does give you a glimpse of the new default theme, called Ambiance. A nice mixture of muted purples, oranges, and browns, Ambiance has a somewhat darker and more professional look than the old human theme. Aside from the slick new looks, the default GNOME desktop has been considerably changed in Ubuntu 10.04, with redesigned widgets and the new Me Menu. The Me Menu is a gateway to quickly access chat clients and "broadcast accounts" - which include Twitter, Facebook, and the like - through the very slick social networking tool, Gwibber. Ubuntu One adds online backup and file sharing. The Ubuntu One storage is designed to give you a simple way to backup, sync and share files over the web. Ubuntu One offers 2GB of storage for free, with a 50GB option for $10 per month. 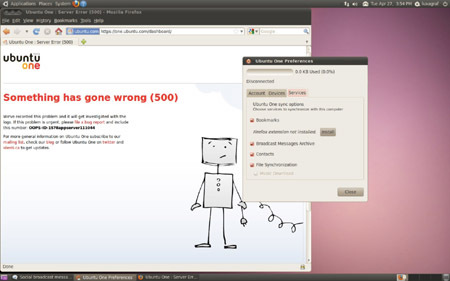 Ubuntu One also offers public shared folders, which other Ubuntu users can access from their desktop. Anyone not using Ubuntu can still access the files through their browser. Sadly, Ubuntu One continued to be somewhat buggy in my test. While actually syncing files, contacts through Evolution and notes through Tomboy worked just fine, the web interface continually timed out or failed to load for one reason or another. Still, so long as you don't rely on the web-based access, Ubuntu One make a great file syncing service, and now that it's included in the Me Menu, it's even easier to access and share your files.